Deciding to invest in a backyard remodel to expand your living space is always an exciting event. Of course, having a pool and an outdoor seating area are often essential components of these types of remodeling projects. However, it’s the finishing touches that can help transform a utilitarian backyard space into a truly luxurious retreat. In this post, we will outline 3 ways to put the finishing touches on your backyard remodeling project. The typical patio area certainly includes a table and chairs, but if families really want to relax outdoors, additional seating options can help. Consider adding pool lounges that are half submerged in water for that truly posh resort feeling. 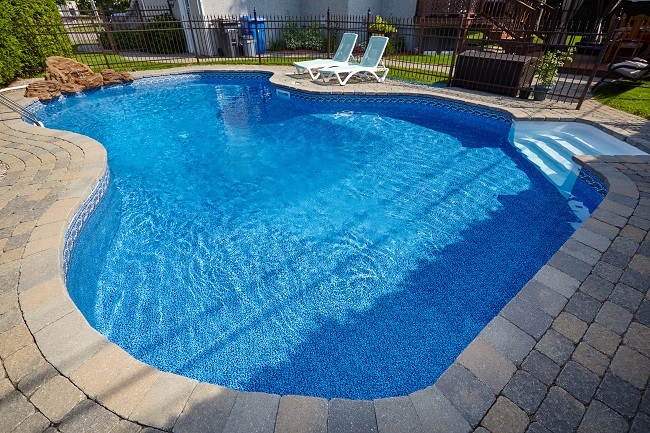 In addition, look for areas around your pool where you can create a comfortable gathering space for those who want to relax after swimming. Invest in some good-quality outdoor cushions and lounge pillows that can heighten the posh factor of all your seating arrangements as well. A backyard remodel is the ideal time for homeowners to add an outdoor shower. Extending the pool experience to the outdoor shower area not only serves a practical purpose by allowing guests to wash off after a dip in the pool, it also extends that luxurious, tropical feeling that everyone is always looking for. An outdoor shower experience, surrounded by natural stone and wood accents, helps extend the feeling that one is truly relaxing in a natural environment. The pool area is great during the daytime but it can really exude relaxation in the evening as well. What is more relaxing after a stressful day than walking outdoors and unwinding under the soft flickering of lanterns, tree lights and wall sconces in your own backyard oasis? If you would like more tips on how to turn your backyard into the relaxing getaway you’ve always dreamed of, please contact us!